I wanted to add, and sorry if it's already obvious, but whenever you intend to use a limited number of colors, it's better to work in "indexed colors" mode rather than truecolor (RGB) mode. This means that at any point in time you can change one color "in the palette", and it will affect everything you have drawn so far using this color. eishiya - thank you very much for the advice, I know a lot of effort went into writing that post and I'm really grateful for it. I use the color blocks even for still pieces because it helps me decide and visualize the shapes without worrying about colors and maybe clean it up also to avoid jagged lines, then I worry about colors afterwards. yrizoud - thanks a lot ! how do you change colors on index color mode? what are the process or settings to color on index mode? I'm using Photoshop, and if I use "Image > Mode > Indexed Colors" it seems to lock the layers. Day 9 progress. My first experiments at game-like side view, and went with 100 x 100 pixels. I don't plan to increase the pixel size until the level of my quality increases by a lot. could really use advice regarding this view, and regarding the past pieces. I'd like to ask, what am I doing wrong ? Am I ignoring any pixel art techniques ? is there any advice I should be following more ? I think you should look into banding-avoidance, you have quite some banding on the arms for example, there are some great threads about this here in the resources, and Helm's thread remains a great reference for anyone learning pixels. You should probably look into casting lights and shadows on solid objects of various shapes as well, like spheres, ovals and cylinders, then try to apply that on other complex stuff. That is not much of a pixel technique thing as it is a general art skill that goes across media. For instance, you hair has a subtly dithered gradient, which is a distinct pixel art technique, but it is applied flatly on the hair color block, so it doesn't help to define the curved shape of the hair wrapping around the head. Can you see the flatness? - i haven't worked with index colors before. I'll try that thank you very much. - yes I tend to do a lot of banding or fat pixel. I'm trying to break the pattern by not fully coloring the next row of pixels but it seems like it still looked like banding. Thank you for the comment I'll try to avoid that next time. On the purple dress girl with bunny, I tried not to use reference for the experiment. I used trial colors for theory, did hue shifting yet I'm not sure if I selected the right warm and cold colors. I chose colors by putting a blue and yellow layer on top of the palette and change its opacity numerically and by intensity so it blend with original colors and create new warm and cold colors. not entirely sure about it. Also did some external AA. Realized I should make art with references more. The girl in the jumpsuit is inspired by Fool's pixel artwork. I created the character with the use of his color palette and tried to study his art style. Aside from poses, I still struggle a lot in choosing colors. I guess I have to practice more. The round shapes are some of my color experiments. Used compound colors on the blue armored guy then used complimentary colors on the greenish knight. I feel that in both cases and on your spheres, but especially on the blue guy, you could use more hue-shifting to help bring the colours together and make them more lively. On the blue guy, you don't seem to be hue-shifting at all! An unrelated crit: the greenish knight has a lot of pillow-shading in the rounded areas (the knee guards, the boots, the tassets), shading around the edges of shapes instead of according to the 3D form of those shapes. This also leads to a lot of banding. Don't be afraid to have well-lit portions of a shape bump up against another object! Your light seems to be coming from the upper left (aside from a few random bits lit from the upper right xP), and unless something is casting a shadow from that direction, that means the upper left of round objects should be well-lit, even if that's right near the edge of the object. You should also not be afraid to have light colours right up against dark ones without a buffer of medium colours, especially for shiny/reflective objects, or objects with sharp corners! 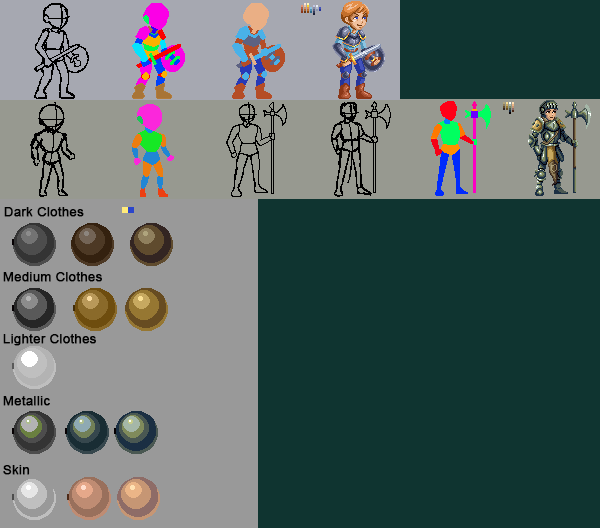 I most likely misinterpreted some of the armour pieces, which might result in some nonsense areas. If my critique above doesn't help you understand something in this edit, feel free to ask!